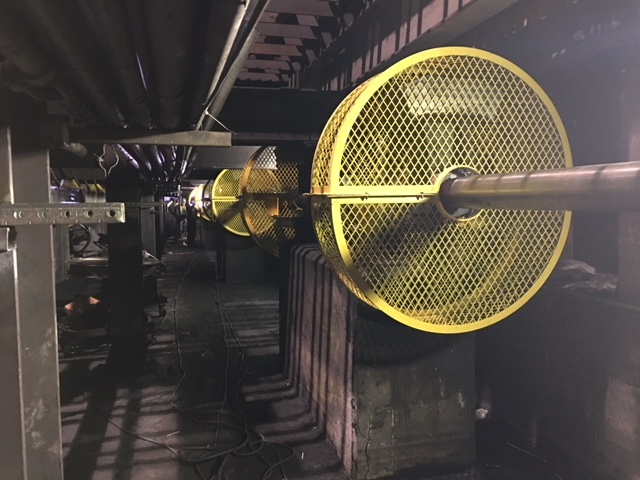 GMB Heavy Industries has just completed a successful installation of a new Eccentrics Drive Shaft System Assembly in the cooling bed of a Steel Plant in Auburn, New York. In order to minimize lost production, the installation was completed in a compressed timeline of only seven days. The new shaft assembly was necessary to upgrade the capacity of the bed and to overcome ongoing problems the mill was experiencing in operating the bed. These problems were caused mainly by two issues. One was that the counterweights repeatedly separated from their brackets, and the other was the additional capacity of the product that was handled by the bed. Both of these issues caused undue stresses, which in turn, led to undue wear on the moving parts, especially the gearbox. The new assembly was designed to comfortably accommodate the higher product throughput experienced by the cooling bed and to minimize unnecessary stresses. The bed can now be expected to operate with reduced maintenance over an increased lifespan. Before the upgrade, the bed ran very noisely, but now that indexing stresses have been reduced to a minimum, the bed produces little noise when running. This increased noise level was coupled with the excessive vibration of the steel mill equipment, which has now been reduced to minimal levels. Another benefit of balancing the bed, frequently overlooked, is that the energy requirements to operate the bed are greatly reduced. With a bed that runs continuously, this translates to tremendous financial savings over an extended period. GMB excels In the custom design, manufacture, and installation of equipment and spare parts to modernize and upgrade the existing Long Product Rolling Mills. The GMB installation team frequently completes installations ahead of schedule, in order to minimize the financial loss to our customers, caused by loss of production while the work is being completed. In addition, GMB supplies only the highest quality equipment including Eccentrics Drive Shaft System Assembly and spare parts, which are carefully installed and aligned, to ensure minimum maintenance and long life. Our more than 30 years experience in the business, has provided us with the knowledge and expertise to provide our customers with the sound advice and guidance they need when discussing their production challenges. Our constant aim is to help our customers successfully achieve their goals, at the most competitive cost. Want to get in touch with our Technical Rep?